Vuvuzela horns made a comeback in the District this past weekend, but this time in support of a different kind of soccer player -- formerly homeless ones. 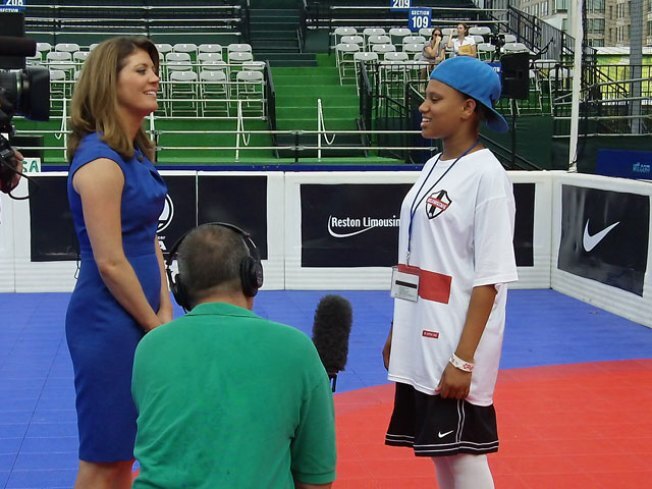 The Washington Kastles stadium in the nation’s capital – the city with the highest rate of homelessness in the country -- hosted homeless soccer players from 19 cities across the country to compete in the Street Soccer USA Cup. After inspirational remarks by Mayor Adrian Fenty and a soulful performance of the national anthem by former American Idol contestant Austin Bisnow, a ceremonious “kick-off” by a number of Washington bigwigs -- including the mayor himself, Ted Leonsis, and Sheila Johnson -- got the balls rolling for a unique three-day soccer tournament. It is no secret that sports possess a certain innate power that can extend off the court, field or track. Athletics have served a variety of purposes over the years other than just mere exercise, from kids settling silly run-of-the-mill disagreements on the basketball court to former South African President Nelson Mandela bridging racial divides in the “rainbow nation” by throwing his support behind the primarily white men’s national rugby team Springbok. But the power of the game of soccer is in a category of it’s own -- even as powerful as prompting a cease-fire amidst a bloody civil war in the Ivory Coast after the soccer team qualified for the World Cup. Recognizing soccer’s diplomacy capabilities, Street Soccer USA is harnessing the calamity of that force and throwing it into bringing homeless people off the street and literally helping them back onto their feet. It all began at a homeless shelter in Charlotte, N.C., where Lawrence Cann, 32, founder and CEO of Street Soccer USA, was volunteering after spending a year abroad and realizing he wanted to spend his life trying to make a difference. He started to see more teens on the streets and thought that athletics would be a good outlet, so he started the homeless shelter’s first soccer team in 2005. Cann himself was a soccer player, having spent his college years at Davidson active within their nationally recognized program. The Street Soccer USA program model was spread through both the soccer world and the homeless services world. “Because we kind of understand both, we were able to be successful,” Cann said. Through soccer he created a community for homeless people who would normally be isolated by society. “What this provides is a trusting environment, really a rare commodity on the street, which is positive energy, re-enforcement and mentors,” he said. Cann himself had experienced comparative loss when his family’s house burned down when he was younger. But for him, it was a positive experience of community reaching out to help. And so he wanted to do something for those alone and less fortunate. “We’ve come to view homeless as the symptom of the breakdown of community so we try to build that back up,” he said. Now the Street Soccer USA community he built stretches across the country and around the world. After linking up with HELP USA, a leading provider of jobs, homes and services for America’s homeless since 1986, they became nationally recognized as a contender among those fighting homelessness. But it wasn’t until they began working with the people who run the Homeless World Cup and Ted Leonsis, filmmaker and owner of the Washington Wizards, Mystics, and Capitals, that Street Soccer USA became internationally known. In 2006, Cape Town, South Africa, hosted the Homeless World Cup. One of the players Street Soccer USA sent was Craig, a young African-American male from the streets of Charlotte with a history of anger issues. Leonsis, whose production company was filming a documentary called “Kicking It” on the institution of homeless soccer, took an interest in Craig’s story and included him with the six other homeless player profiles in the film. Now, five years since it’s initial debut, Street Soccer USA has a 75 percent success rate for those who go through their program, which includes setting three-, six-, and 12-month life goals, and a number of successful stories, including those of two players who stood out in the Cup this past weekend. Jasmine Morris, 19, and Takombe Ajiboye, or TK, 26, both ended up homeless on the streets -- TK because of the poor decision to smuggle heroin from Nigeria to the United States and Jasmine because, frankly, her parents just didn’t want her. Ending up in jail, TK served his time, but upon his release, eventually found himself alone with no home or family in the country of his birth. He had no choice but to go to a shelter in Queens, N.Y.. He recalls the day like it was yesterday. The rest is history. TK was pleased to discover the shelter had a soccer team and eventually became a star. During the SSUSA CUP in Washington, both TK and Jasmine scored high marks in all three categories -- achievement off the field, team spirit and support, and ability on the field. Both also stood out as positive team leaders, pulling their teams together especially when they were losing. TK sent his coach a text message after he got back to New York, saying, "We didn't bring the most talented team from NYC, but I was really proud to have been a part of this time. Thank you guys." TK, who is now a waiter at Crest Hollow Country Club in Long Island and a student on a soccer scholarship at Global Tech, was named to the U.S. Men's National Homeless Soccer Team and will be traveling to Rio de Janiero, Brazil, to play alongside 64 different nations in the Homeless World Cup from Sept. 19-26. When asked if he would like to be selected to travel to Brazil he expressed his concern with not missing too much school. “I’ll just have to bring my textbooks with me,” he laughed. Jasmine was selected as one of the members of the first-ever women's team to play in the Homeless World Cup. She will be starting her studies at beauty school in the fall. After another successful SSUSA Cup, several cities, including D.C., are interested in bidding to host the games next year. Until then, Lawrence Cann hopes volunteers will get involved by visiting iplayfor.org.